What are the best tours to do in Jamaica? It's official, all the top travel entities rank Jamaica right at (or near the top) of the best places to go, especially in the Caribbean. From the pristine white sand beaches and captivating friendly smiles to the enthralling tours and attractions, Jamaica stands with the very best. In fact, in 2018 Jamaica welcomed 4,310,000 guests from all over the globe to taste of its glorious splendors. I've now compiled what I consider to be the best tours to do in Jamaica, a must visit for you. If you are like me who love all kind of adventures, this will be great for you! You will have the most awesome experience as you horseback ride into the warm ocean waves. This tour is available at all three of the island’s chukka locations. These are Chukka Adventures Falmouth Chukka Adventures Ocho Rios and Chukka Adventures Sandy bay, in Hanover, which is just about 25. 3 km away from Montego Bay. Another of my favourites! I strongly recommend that you add this to your list of activities. As you take the 35-45 minutes cruise around the lagoon, you will experience the glowing beauty of the water in the dark. What's behind that glow? Well, surrounding the lagoon are mangroves that forms the habitat for microscopic organisms known as dinoflagellates. 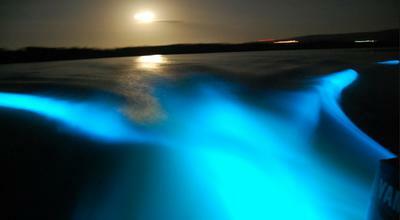 Whenever these organisms are disturbed, they emanate a magnificent bioluminescent light which illuminates the water, giving it an incredible vibrant blue colour. It’s easy. You can either schedule the tour from the tour operations desk at your resort, or directly contact the Glistening Waters Hotel and Attractions located in Falmouth to schedule your tour. And, did you know that the lagoon is the largest and most vibrant of the four in the world? Yep, it is definitely worth it my friend! Then their is the world famous..
... approximately 70 miles from Montego Bay. The cascading waterfall will take your breath away as you immerse yourself in all its wonders. A famous activity for guests is climbing the falls by holding hands which is usually done with a tour guide. However, you are always free to climb independently if that makes you more comfortable. You can also enjoy the gorgeous white sand beach where the river flows for an extra activity. This tour provides a remarkable downhill ride along the majestic mountainsides. Added to that, you will have the ease of capturing a spectacular view of the island. Bike lovers will sure enjoy this rush of excitement. These All-Inclusive tours are available from Mondays to Saturdays whether or not it rains. Couple, single or family, it doesn't matter, the more the merrier! For those who desire a more calm, sedate and relaxing experience, rafting on the Martha Brae River may just be the right tour for you. This is also a great option for couples who are planning a romantic getaway. You'll enjoy the beautiful sights and sounds, including several exotic species of Jamaican birds. So there you go! My recommended top tours to do in Jamaica. What's your take on them? Is there another one you think should be included? I'd love to get your feedback here.